Confession: before I painted these nails.. I had bare nails for TWO DAYS.. in a row. I don't even remember making a full day with bare nails in the last.. well, couple of years. I honestly had zero ideas. Once my sister got wind of me not knowing what to do with my nails, she said 'do those roses on one nail, and cheetah print on another..' and then I thought 'hey, skittles are the next thing on the challenge list.. I can totally skittle with those ideas.' Because. To me, the whole "skittles" nails means they are all different, but related. She suggested hot pink polish. Done. Wow. Typing out the list of products used was a beeeast. Stick with me here, and I will go through what was used on each finger, and, if I bought them via a specific website, I'll link it up. 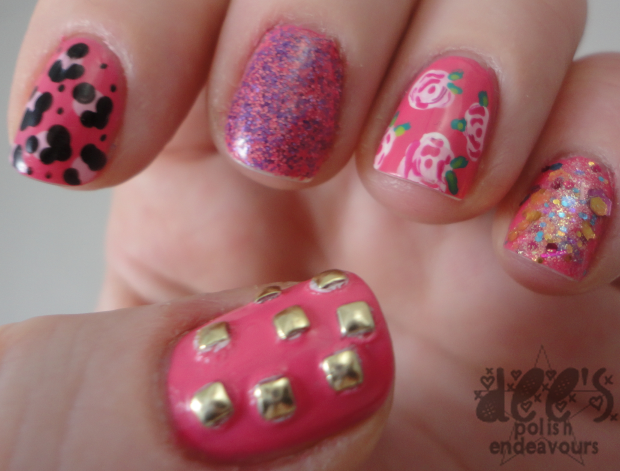 Thumb: China Glaze Sugar High & gold studs.. and some super glue and Poshe top coat. 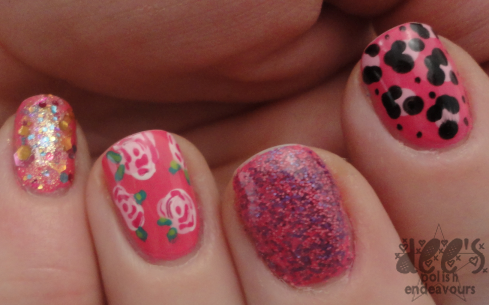 Index: China Glaze Sugar High, Daisy Nail Lacquer Sachet Pink (from my amazing pal Silver!! ), China Glaze Liquid Leather & dotting tools. Ring: China Glaze Sugar High, Orly White Out, Daisy Nail Lacquer Sachet Pink, OPI Kiss Me On My Tulips, Brucci Lime Green (no label..), Brucci Roberta's Green Garden, & dotting tools. Pinkie: China Glaze Sugar High & 2 coats of Rainbow Honey Pinkie Promise. These seem like they would be highly labour intensive, but I think I spent maybe 40 minutes max on them. And. I absolutely love it. They all work together, but are still completely different. Did I ever mention that I adore my sister? ?